13th September 2018 WEM-SocialWorld Extreme Medicine Conference Workshops#WEM18, workshops, world extreme medicine conference. 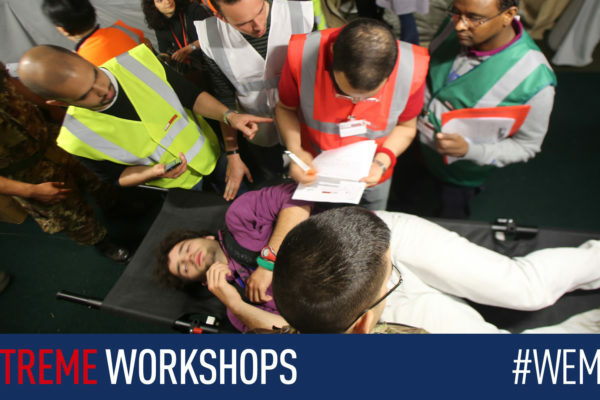 If you are joining us at this year’s World Extreme Medicine Conference (#WEM18), taking part in one of our practical workshops is an absolute must! With more than 80 amazing speakers across all medical and expedition disciplines coming together to deliver talks and offer unparalleled advice and inspiration, where else in the world could you get so hands-on with so many like-minded medical mavericks. Running across all 3-days of the conference, our hands-on workshops offer opportunities for all delegates to learn and practice medical techniques and skills that will help them rise to the challenge of practising medicine in an extreme and low resource environment. We understand that as a medic each day presents new and unique challenges; whether it be an inhospitable environment where conditions are extreme, a patient with life-threatening injuries that needs immediate attention and quick-thinking decision making or working in an under-resourced environment where equipment is limited, and you need to use your knowledge and skills to improvise using only the very basic of equipment. By enrolling on one of our interactive workshops you’ll receive practical specialist knowledge that will help you understand the sorts of issues you will potentially encounter and that you can take away and apply to your everyday working life, whether that be in a clinical practice, teaching or as part of an expedition. Our World Extreme Medicine Conference workshops are now bookable online including an unmissable session on Expedition Dentistry led by Burjor Langdana, a physio workshop ‘Keeping the Athlete Moving’ led by WEM Faculty & ex British Olympic Team physio Laura Penhaul, our informative ‘Tropical Medicine in a low resource environment’ led by Derek Sloan, plus, our very popular, now daily, workshops offering practical advice on ‘How to get your first job as an extreme medic’ – perfect for those health care professionals wanting to get their initial experience/job as a remote medic. Also, back by popular demand after the sell-out sessions last year is our ‘Caught in the Middle of a Multiple Casualty Terrorist Attack!’ workshop on Day 3 of the conference. Each session will begin with a talk on ‘The evolving terrorist threat’ and what to do in the first crucial minutes to help keep yourself safe and save lives. Be inspired and join us for THE conference of the year – book your place today!